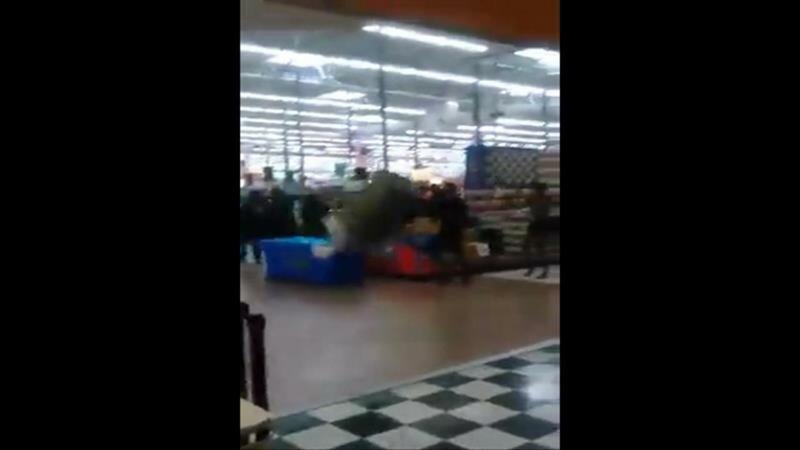 Four people were arrested last weekend after a 30-person fight broke out in an upstate New York Wal-Mart, authorities said. The brawl allegedly began after an insult about a woman's dress. Authorities said that the melee began around 7 p.m. Sunday after two 17-year-old girls insulted a 24-year-old woman about her clothing in the Gates, N.Y., Walmart, six miles from Rochester. Gates Police Chief Jim VanBrederode said the minor altercation turned major when the families of both the victim and the suspects got involved. First video of the melee was posted to Facebook. "It was in total chaos when the officers got there," VanBrederode told NBC affiliate WHEC. "It's just disgusting to see that kind of behavior happening right here." During the fight, authorities said participants went into the sporting goods section of the store and armed themselves with baseball bats. One of the 17-year-old girls threw a can of food, hitting a man in the head, police said. The girl who threw the can is charged with assault and harassment, police said, but NBC News is not naming her because she is a minor. A second minor is also charged with disorderly conduct, along with Patrick Goodwin, 21, and Jasmine Jones, 21, police said.